Money is tight at our house so I need to find tasty inexpensive food that will go over with the kiddo. I hit gold, well orange really, last night with some baked yams. I got the idea in my head about yams the other day while I was blithely following the ephemera on Twitter. I saw that one of the chefs I follow said that baking, sautéing, or steaming yams preserved their nutrients better than boiling them. So I baked some! 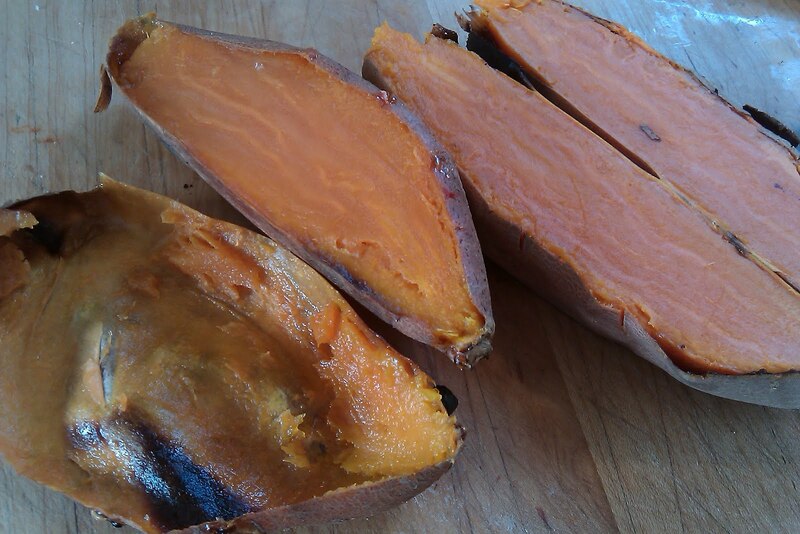 These were two rather small yams that I pricked with a knife and threw in a 450º oven for 45 minutes. No salt, no oil on the skin, not even a pan to roast them on. I just threw them on the rack and went on my way. When they came out of the oven I let them cool down a bit while I was finishing my wild rice dish (below). When I sliced them open they didn't look like much, but when I scooped out the tender, sweet smelling flesh, it glowed with vibrant color. 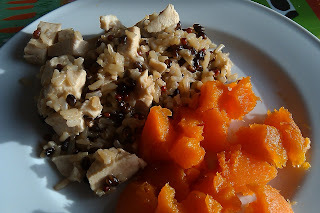 My wild rice dish was super easy to make and was ready in the time that the yams were in and out of the oven. I sauteed some shallots in olive oil, then toasted 3/4 cups wild rice over medium heat. After a couple of minutes, I added 1 1/2 cups of chicken stock and 3/4 cup water, brought it to a boil, added a good pinch of salt and a few leaves of fresh oregano from my garden, lowered the heat to medium low, and covered it up. I set the timer for 15 minutes and added some chopped leftover chicken breast while the rice was still boiling away. Covered it back up and let it cook for 5 more minutes. Easy, quick, Yum!! 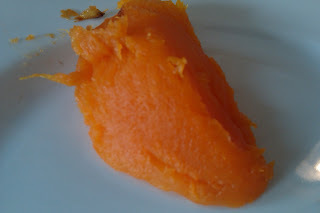 The kiddo loved the yams and devoured the rice. I love that. This is a great dinner to make a little more than what you will eat in one night. Add some olive oil and a dash of vinaigre to the rice and you have a great salad. 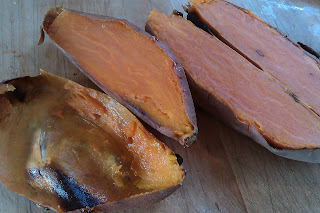 Do nothing to the yams... they're still amazing! !